Dental cavities can strike at any age, and if left untreated, can lead to tooth loss. General dentistry treatments can help prevent dental cavities and protect the smile from tooth loss. If you already suffer from dental cavities or tooth loss, there are many treatments available to restore your smile. To discuss your treatment options for tooth loss and cavities, schedule a consultation with Wilmington, DE dentists Jeffrey J. Emmi and Laura Dougherty. Dental cavities, also called “caries,” are a form of tooth decay caused by acids from bacteria and the foods we eat and drink. These acids can dissolve the outer enamel layer of the teeth, leading to holes forming in the enamel. Once the enamel is damaged and a hole, or cavity, begins to form, acids within the mouth will continue to corrode the enamel, causing the cavity to grow larger and larger, eventually reaching the inner structures of the teeth. Dental cavities are most commonly caused by plaque buildup, or more specifically, the bacterial acids found in plaque. Plaque is made up of food debris, bacteria, and acids from bacterial digestion. Plaque bacteria thrive on sugar and excrete acid. When plaque is allowed to stay on the teeth for prolonged periods of time, the acids are left in direct contact with the enamel, leading to the formation of cavities. Not brushing or flossing the teeth regularly allows plaque to buildup on the teeth and along the gum line, increasing the risk of tooth decay and cavities. Combining poor oral hygiene with a diet high in sugar and acids can allow dental cavities to develop quickly. How Is Tooth Loss Caused by Cavities? If left untreated, dental cavities can lead to tooth loss. A small cavity will grow larger and larger if dental treatment is not obtained. 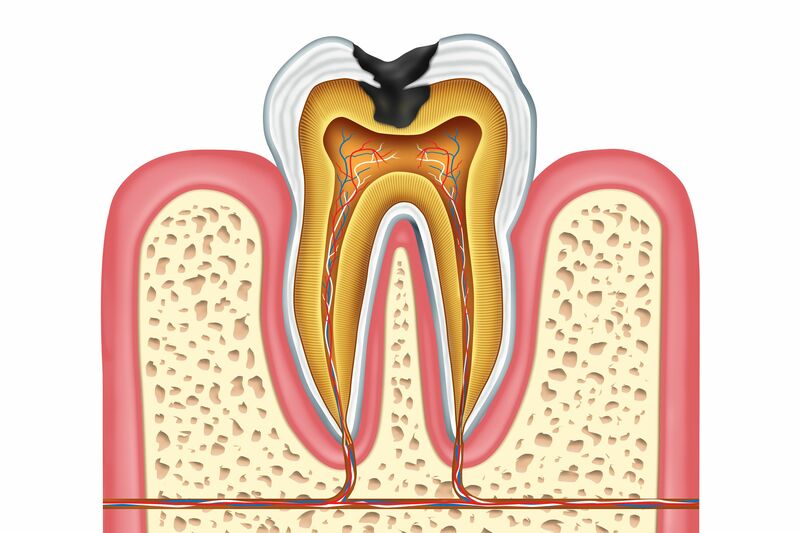 As a dental cavity grows, it will erode through the layers of the tooth, eventually reaching the delicate structures within the root canal, causing a root canal infection. Root canal infections are particularly dangerous to oral health as they directly affect the tooth's nerve tissues, pulp tissues, and blood vessels. When these tissues become infected, the tooth may die and fall out or become so damaged that extraction is required. Although preventing oral health issues is preferable, there are many treatments available to treat cavities and tooth loss. Tooth-colored fillings are a great option for restoring the oral health and appearance of teeth damaged by dental cavities. For those who suffer from root canal infections, root canal therapy is often effective in treating infection and saving the tooth from requiring extraction. Root canal infections may be combined with dental fillings or dental crowns to completely restore oral health. For those who have experienced tooth loss, dental implants provide a permanent option for restoring dental function and the smile's appearance. For more information about your treatment options, we welcome you to schedule a consultation with our team at Emmi Dental Associates.